Some of you may know I have a fear of baking with yeast. My first experience was in 4-H and not a very good one so I have tended to shy away from baking with yeast my entire adult life even though I love baked goods made with yeast. So that being said when I found the recipe for Beer Bread in Gooseberry Patch's Hometown Harvest cookbook, I knew I had to try it especially since was recommended for serving with that Fried Corn Chowder we happened to love. In a bowl, stir together flour, sugar, baking powder, and salt. Add beer; mix well. Pour into a greased 9"x5" loaf pan. Drizzle butter on top. Bake at 375 degrees for about 40-50 minutes, until golden. Slice while still warm. We have loved every recipe we have tried so far from Hometown Harvest so don't forget to enter for your very own chance to win a copy of the cookbook! 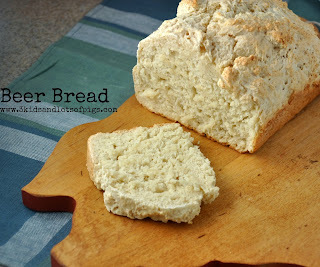 There is another recipe that uses self-rising flour, sugar, and beer. I guess butter on top would be the fourth ingredient. LOVE smelling this bread bake in the oven! YUMMERS!